SENGENICS, a leading genomics and proteomics-based research and diagnostics company in the region, yesterday launched a world-class, commercially driven facility in Brunei Darussalam. 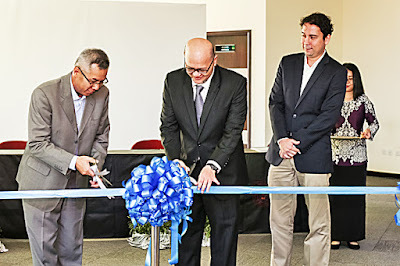 Opened at the Universiti Brunei Darussalam (UBD)’s Integrated Science building, the state-of-the art Sengenics Immunome Production Facility is expected to give a fresh momentum to the economic diversification efforts of the country and intensify the development of cutting-edge knowledge industry through innovation and technology. The new facility will offer protein cloning and expression services using the patented BCCP (biotin carboxyl carrier protein) folding marker technology from Sengenics. 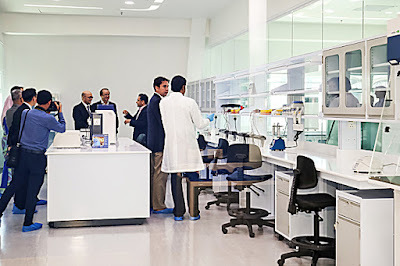 According to Sengenics Chief Executive Officer Dr Arif Anwar, in the last six months alone, Sengenics has secured commercial projects from five out of the top 10 pharmaceutical companies in the world. The new set-up will also play a key role in supporting the commercially available flagship technology being offered by the company – the Immunome Protein Array Platform – which is used for a variety of pharmaceutical screenings and drug discovery applications. Officiating as guest of honour at the launching ceremony was Haji Hamzah bin Haji Sulaiman, Permanent Secretary (Economy and Finance) at the Prime Minister’s Office, as the personal representative of Dato Paduka Awang Haji Mohamad Roselan bin Haji Mohamad Daud, the Deputy Minister at the Prime Minister’s Office. Later, Haji Hamzah witnessed the signing of the scholarship agreement between Sengenics, UBD and five Masters by Research students.The five students are Noor Adlyaini Nur’Afina binti Nudin, Nur’izzati binti Ibrahim, Siti Hamizah binti Haji Zainal Abidin and Siti Farah Hafizah binti Haji Mat Rasil, who have been awarded scholarships to pursue Masters of Science in Biotechnology and Masters of Health Science in Biomedical Sciences. The partnership between UBD and Sengenics grew from a research collaboration agreement, which began in July 2014. Also present to witness the auspicious event were Benjamin Boddy, Acting British High Commissioner to Brunei Darussalam, and the assistant vice-chancellors of UBD. In his speech, Dr Arif Anwar said, “Sengenics has lived up to its promise to the Brunei government by delivering a world-class, commercially driven facility, which not only promotes economic diversification of the country but also intensifies the development of cutting-edge knowledge industry through innovation and technology. “With Brunei as its base, revenue generated from the Brunei operations are predominantly from overseas customers contributing to the export revenue of Brunei. Meanwhile, the Sengenics Graduate Research Scholarship Programme will provide students with more exposure to breakthrough research, along with the opportunity to work alongside high-profile international collaborators. By working in the Sengenics Lab, the students will also get to interact with Professor Jonathan Blackburn, Chief Science Officer of Sengenics and a world-renowned expert in the field of proteomics, who invented the Immunome Protein Array technology. Chief Professor Dr David Koh Soo Quee, the Assistant Vice-Chancellor (Research and Innovation) of UBD, said, “This Sengenics Graduate Research Scholarship initiative demonstrates an industry’s commitment to establish relationships with institutes of higher learning. Sengenics is a Malaysian genomics-and proteomics-based research company, with a range of patented technologies and products that are marketed to pharmaceutical companies, scientists and hospitals in 42 countries. In October 2015, the company announced that it would form a joint alliance with UBD and the Brunei Economic Development Board (BEDB) to focus on two core projects, in response to the Brunei government’s initiative to accelerate biotechnology-related research and development (R&D) activities in the country.